This 1975 photo of cars awaiting export illustrates the rapid growth of the Japanese export economy after World War Two. 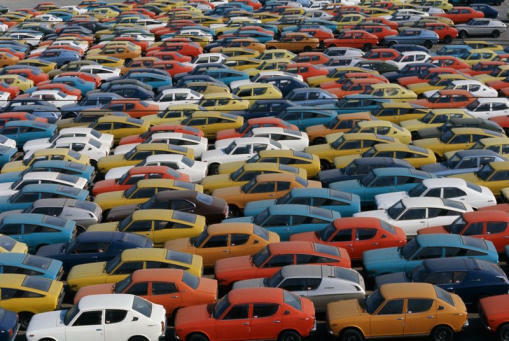 The Japanese economy was booming, partially fueled by exports to the United States, US purchases of materials for the Vietnam War, and a rapid increase in exports of smaller, more fuel efficient cars as a result of the rapid increase in gas prices in the early 1970s. This picture shows a pier filled with Japanese cars awaiting export from a port in Yokohama. March 2, 1975.